In the circuits being investigated here, the commutating inductance is neglected. By controlling the instant at which the thyristors are triggered, we can control the magnitude of the output dc voltage. If the thyrsitors are supplied with a gate current continuously, the sequence in which the thyristors would begin to conduct would be exactly the same as the diodes in the three-phase diode bridge rectifier. The instant at which thyristor xt1 would have started to conduct if it was supplied with a continuous gate current is referred to as its instant of earliest possible conduction. Similar instants of earliest possible conduction can be defined for the rest of the thyristors. In practice, each thyristor is triggered with the same delay angle a to control the output dc voltage. The conduction sequence of the thyristors would remain the same, and they would conduct for 120 degrees per cycle, with a new thyristor beginning to conduct at every 60 degree interval. It can also be observed that for any value of a between 0 and 180 degrees, the thyristor to be triggerd is forward biased and the commutation voltage exists with a correct polarity to cause current commutation. Current commutation occurs instantly here because the commutating inductance has been assumed to be zero. 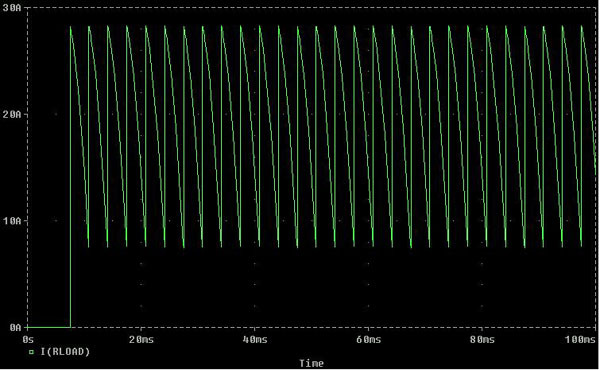 From the expression given in (A), when a is between 90 and 180 degrees, the dc output is negative. This is practically true and when a is in this range, the converter works as an inverter. When a is between 0 and 90 degrees, it works in rectfier mode. Figure 11. Circuit as represented in the Pspice code with nodes numbered. The commutating inductances have been ignored because the simulation had a lot of convergence problems while simulating with them. It should be noted here that, each thyristor has to be triggered in order to be able to conduct when it is forward biased. 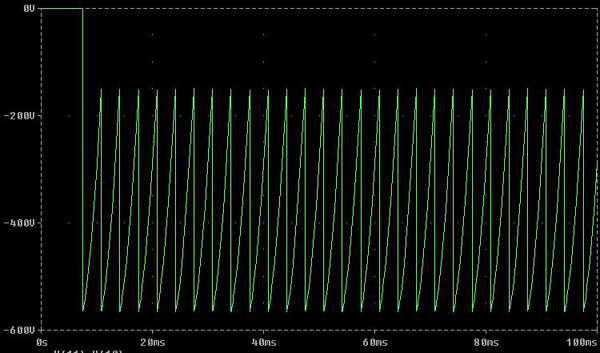 Representing phase voltage Va or V1 as the sine wave with 0 phase shift, followed by Vb with �120 degrees phase shift and Vc with �240 degrees phase shift, the instant of earliest possible conduction for thyristor xt1 is after 30 degrees. 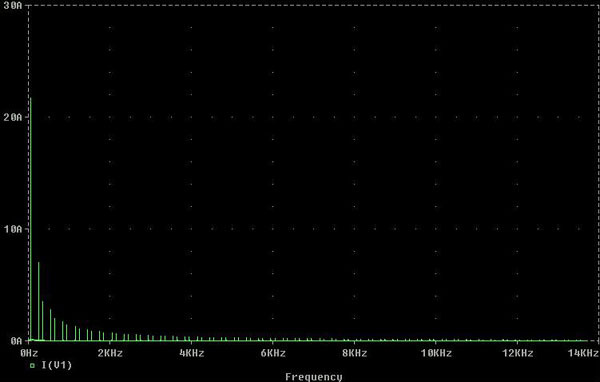 If the delay angle a is 45 degrees, the application of a pulse voltage to the gate of xt1, should be delayed by 30+45 = 75 degrees. 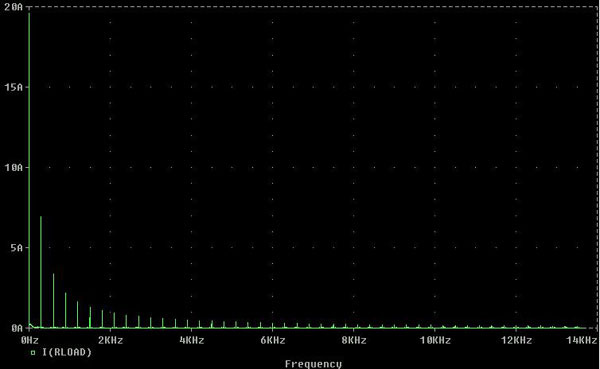 Since the input voltage frequency is 50 Hz, the period is 20 ms. 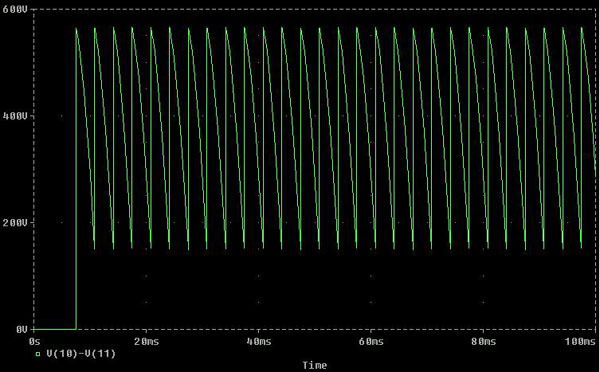 Hence, this 75 degrees delay corresponds to a delay of 4.16 ms. Each new thyristor is triggered after 60-degree or 3.333 ms interval. Each thyristor conducts for 120 degrees or 6.667 ms after being triggered once before turing off. These numbers will be useful in understanding the following pspice codes. First of all, the code for the coverter to function in rectfier mode, for a =45 degrees, is given below. This code works correctly. Practical Three-Phase Thyristor converter for alpha=45 degs. Now, the code for the coverter to function in inverter mode, for a =135 degrees, is given below. This code has some bugs. So it does not work properly. Figure 12. Output voltage when alpha = 45 degrees. Figure 13. Output current when alpha= 45 degrees. Figure 14. Output current harmonic components when alpha= 45 degrees. Figure 15. Source current when alpha= 45 degrees. Figure 16. Source current harmonic components when alpha= 45 degrees. When alpha is changed to 135 degrees, the output voltage is expected to be similar to the one shown below. The only difference is that the gentle rise should be on the left hand side and the steep descent should be on the right hand side. It was mentioned earlier that if the thyristors are supplied with continuous gate current, the coverter circuit would behave like the diode bridge rectifier circuit. That means the output would be a six-pulse dc output. However, here we delayed the triggering by 45 degrees and also the triggering pulse was applied only as long as it was needed. 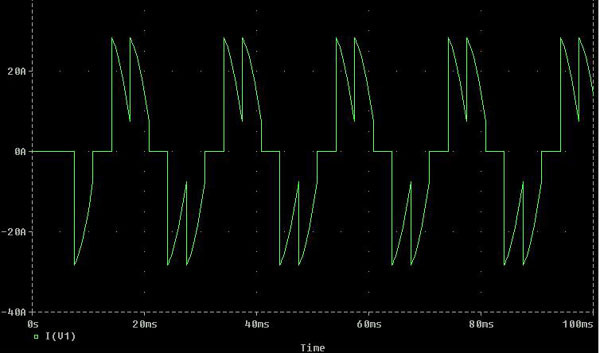 It is for this reason that we see a different form of six-pulse output waveform shown in Figure 12. Fundamental Load current = 19.6 A. See Figure 14. Fundamental component of source current, Is1 = 25 A.
Distortion component in the line current was calculated to be, Idis = 11.06 A. Therefore, %THD = 100 x 11.06/25 = 44.24 %. RMS value of the line current, Is = 27.34 A. Power Factor, P.F = (Is1/Is) x cos j where j is the phase difference between the voltage waveform and the fundamental current component, and was estimated to be 20 degrees.